Sharon was looking for a website revamp/refresh for Ancient Art Falconry. 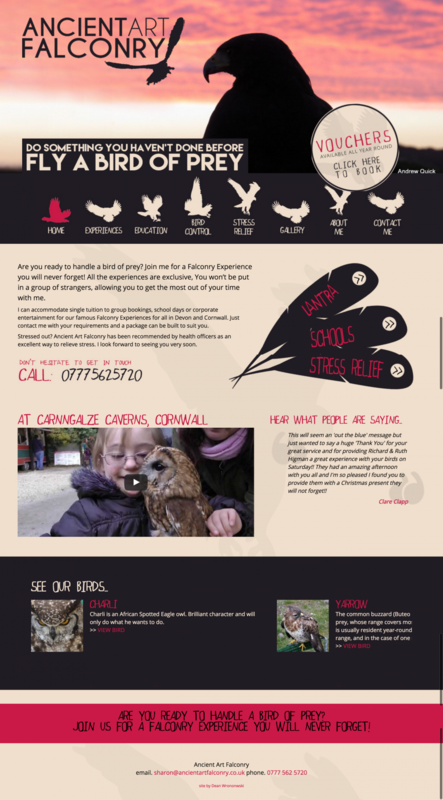 Sharon offers falconry Experience Days in and around Cornwall for the general pupil as well as educating children in schools about birds of prey. Most people will have Smart phones and/or tablets, therefore Sharon requested the new website to be a responsive design to make it easy to view on a variety of different devices – particularly mobiles. Furthermore, she required the new website needed to be found easily by key search engines including Google, Bing and Yahoo and be optimised for falconry search terms. With a basic colour palette combined with silhouettes of birds of prey as the menu icons, the end website design worked out really well.